West Fork Bear River-south of Whitney Res. Started out in the ice box this morning with below zero temperatures, but did warm up slightly, however the winds kept it cool through the day. The storm snow has settled out making for nice low angle and meadow riding. The winds today were getting into the mid and low elevation terrain creating somewhat dense turning conditions. Noticed some old debris piles on the east side of Moffit Peak when the area was going through a natural avalanche cycle. Lots of cracking with today's fresh wind drifts, some up to a foot deep. Although I was not seeing a lot of recent avalanche activity and some riders were getting onto steeper slopes, I'm holding back and letting the snow pack adjust to all the recent snow, water and wind. These are the type of conditions where many of the slopes that avalanched have blown back in and it's easy to feel good about riding steeper slopes. The conditions are good and I find myself wanting to drop into some nice untracked slope, but playing it smart is the key right now. I was hoping for light winds, but all day they were blowing from the southwest and even down into low usually sheltered terrain. A fresh round of wind drifts were forming off the ridge lines cracking up to 8-10" deep. 1. Conditions out in the Whitney Basin are quite good thanks to a generous storm this week. No need to hang it out in steep terrain when low angle and meadow riding is great. 2. It has been awhile since Double Hill has looked this white and filled in. 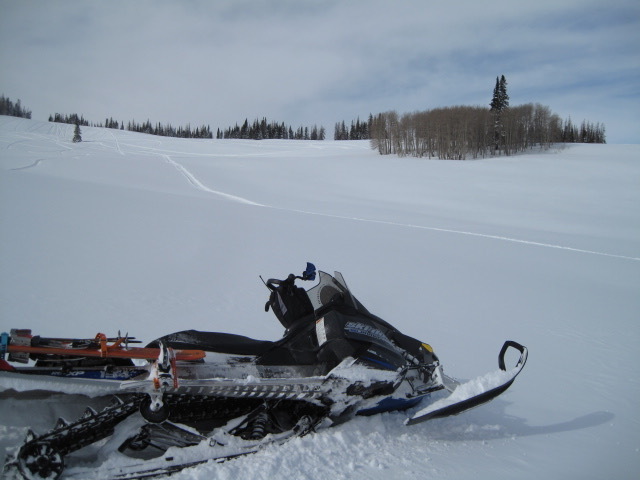 A good clue to unstable snow is cracking ahead of skis, board and sleds. 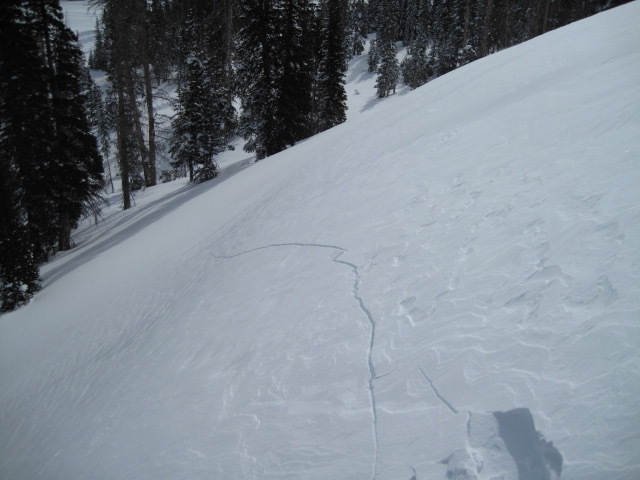 This crack on a small test slope tells me the snow is becoming a slab and is likely sitting on weak snow underneath. 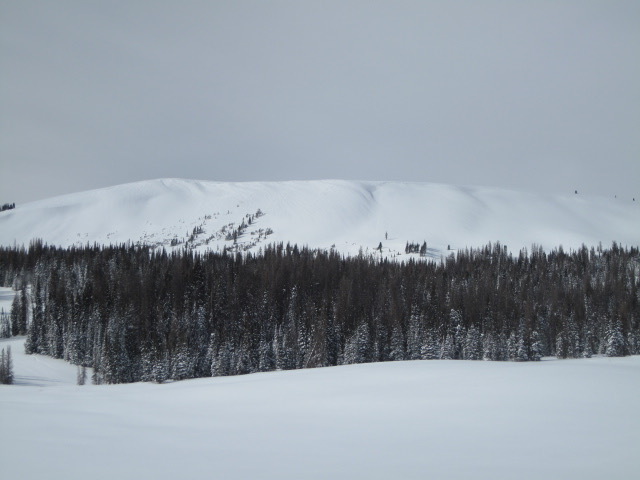 Traveling around today I kept looking at all the great terrain and how white things are, but need to keep thinking how the snow pack feels and give it time to adjust with more storms lined up.